On Saturday 28th April we are holding a free community shredding event outside The Forum in Norwich. The event is to raise awareness of the need to destroy all personal confidential documentation to help prevent identity theft. We are asking people to bring along a bag or two of confidential documents for immediate shredding on our state-of-the-art mobile shredding vehicle. 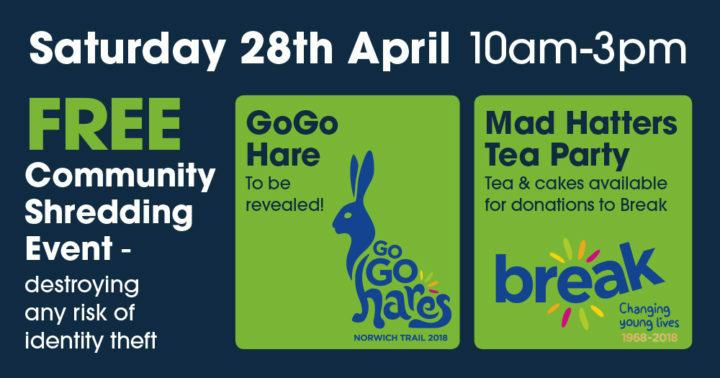 During the shredding event we will be revealing the GoGo Hare we are sponsoring for Break charity’s 50th anniversary trail in Norwich this summer. We were lucky to have previously sponsored Dragon Fly, voted most popular dragon, in 2015 and our GoGo Hare will prove to be an equally unique design for the 2018 trail. Artist Ross White is responsible for the design of this years GoGo Hare, he was also responsible for creating the magnificent Dragon Fly. We look forward to showing Norwich his latest creation. Alongside our mobile shredding vehicle we will be holding a Mad Hatter’s tea party with tea and cake on offer for donations to Break charity. Come along and join in the fun while protecting yourself from identity theft.